Every guest in every session gets his or her own print to take home as a souvenir of the great time they had at your wedding. And if they want extras? No problem with unlimited printing. Your guests can apply a dozen crazy special effects filters to their photos. One pose, for example, can be in sepia, another in multicolor Warhol, and yet another transformed into a hilarious cartoon! After taking their photos, we'll invite your guests to record their personal message to you -- a video "toast" -- allowing you to capture their words and expressions on this once-in-a-lifetime event! You'll cherish these spontaneous video clips from your loved ones for all the years to come. 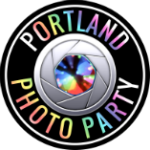 Portland Photo Party's photo booths are connected to the internet, allowing your guests to post their photos instantly to their Facebook accounts, Twitter or send them by email --right from our iPad-based Social Media Station. This valuable feature will let you and your guests share the fun with those unable to attend -- as it happens! With Portland Photo Party, you'll have many ways to keep memories of your wonderful wedding celebration alive. Your guests will be guided by our on-site attendant to complete your Deluxe Photo Scrapbook. They'll attach one of their photo strip duplicates and write a personal message to you alongside. You'll also receive a flash drive with the original photos and videos of all your guests. Finally, your wedding online gallery remains on the web for your friends and family to view from any computer, tablet or smartphone. They can download these images, too.